One of the best-loved of 20th century architectural styles, Art Deco and its dramatic forms, is showcased in this colorful book. 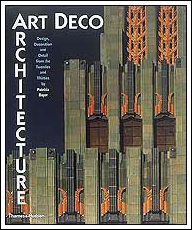 We see Deco masterpieces from all over the world - from skyscrapers in NYC, apartment houses in Paris, restored hotels in Miami Beach, the short-lived pavillions of great expositions, to everyday movie theaters, gas stations, diners, bus depots and public buildings. Take this fascinating achitectural tour and see how exhuberance and adaptability have ensured Deco's lasting popularity. 224 pages, TP, 10" X 12", 376 color illus.